The last two sketches I’d like to share are of crowded gatherings in Fort Myers Beach. I had the privilege of taking the island trolley to the 61st Annual Shrimp Festival, although I couldn’t reach my destination at Times Square because the road was barricaded off for the parade. A huge, long parade, with Shrimp themes! I saw giant shrimp floats, royalty crowned for the Shrimp fest sitting on the backs of convertible Corvettes, and every kind of float, band, clown group, and motorcycle you can imagine. 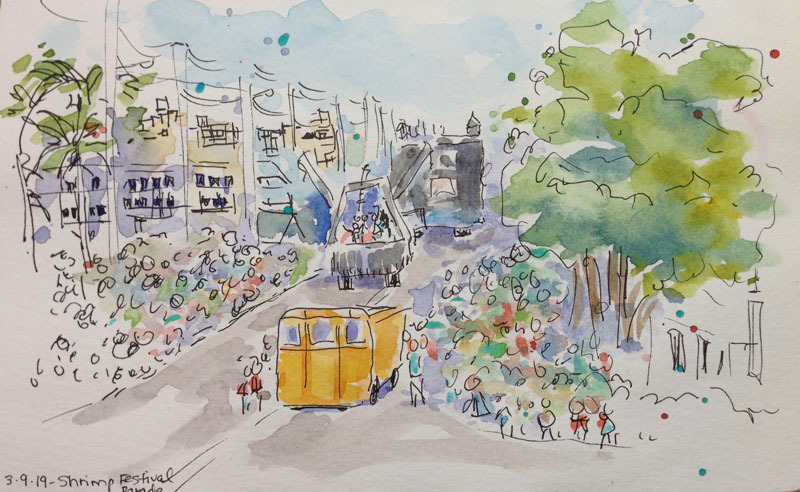 The floats pictured in my sketch are of a giant school bus, a yacht is ahead of that, and in the distance an enormous gray castle float. My favorite was a pirate ship and a giant great white shark where music blared “Baby Shark”. I did the sketch standing up, surrounded by people, so it was done with pen very loosely. I filled in with watercolors. The second sketch is of Times Square at the north side of Fort Myers beach. It’s basically where all the hot action, college students, hotels, restaurants, pier, beach, and water sports are located. I roasted in the sun and loved all the blue umbrellas and lamps. I kept it more abstract and used my black brush pen to darken shadows. It was fun to be a part of the Shrimp Festival!